This open and airy beach cottage rests on a peninsula off Dune Rd in Westhampton Beach called Pond Point. The unusual setting provides beautiful bay views from almost every room in the house, including the dining deck off of the kitchen/living room and the roof top deck. Vibrant splashes of color throughout the house act as instant mood filters. As you walk through the front door you will immediately sense this is a place for easy family living. All the the bedrooms are spacious and well appointed. The master bedroom has a queen sized bed and a twin sized daybed. The second bedroom has a queen sized bed and the third bedroom features two twin beds. A short walk takes you across Dune Road and through the dunes to the Ocean Beach which is accessible only by foot and only to those in the nearby houses. Access to this private beach is a huge feature of the house and the Pond Point neighborhood. Surfers can walk to the left to Jetty 4's consistent break. There a two neighborhood access points to the bay, one directly across the street from the house which is great for launching a kayak (one two seat kayak and two single seat kayaks are available with house rental) or paddle board and the other a short walk around the corner, is a full boat launch. 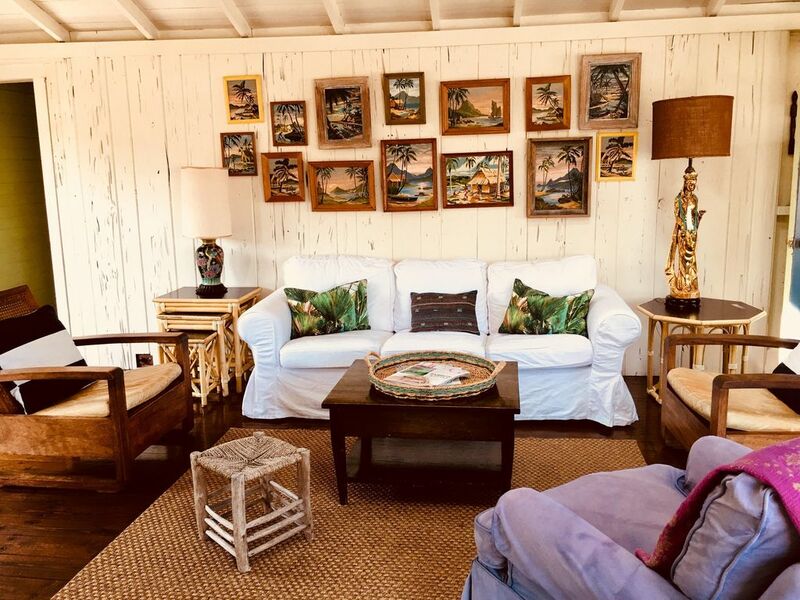 After a day of surf and sun on the beach come back to this charming beach cottage and enjoy breathtaking sunsets over the bay on the rooftop deck. A five minute car ride or mile 1 1/2 mile scenic bike ride takes you into town (Main Street) where you will find an abundant farmers market, wonderful cafes, restaurants, boutiques and surf shop. Pond Point is a most desirable neighborhood for families as children can play and ride bikes throughout the neighborhood while protected from Dune Rd. car traffic. Please see my stellar reviews for a renters perspective on the house. We bought this summer home while living in Manhattan and needing an escape from city life. I have been summering in Westhampton since I was a child. Now my own children are loving the beach life and surfing all the Dune Rd beaches. The house is steps away from the world renowned Hamptons ocean beaches and only 90 miles from NYC. Accessible by car, train and the Hampton Jitney bus. Grab your surfboard walk to the beach and surf Jetty 4! Walk for miles in either direction on the beach or just relax on the quiet private beach in the height of summer. This is a true beach house with a 1930's feel although it was buit in the 1960's. The view of water from every room in the house, exposed beams, wide planked floors and beadboard walls make you feel like you are at the beach even when you are inside. We love to spend lots of time on the beach return home for meals then back again without ever getting into the car. Bay views from every room in the house. Large roofdeck has 360 degree waterviews. dining deck off kitchen, roof top sunset deck and lovely outdoor shower in the back yard. Heather's home was out of this world awesome. I love colors, and her use of curated colors and antique piecees in her interior decor is so inspiring! I never wanted to leave, in fact wanted to make this home my own. It has such great energy, a lovely breeze that dances through the home, great skylights, super comfy furniture and linens. And BONUS! A great roof deck with views from the bay to the ocean! Incredible! She has created a beautiful, welcoming, and inviting space, and I just want to plan another trip so we can stay there again! I stayed at this house with my then fiancee now husband, using it as our marriage retreat during our wedding weekend, and it was such a nice peaceful oasis during the busy wedding activities! Heather was very communicative and friendly as well as understanding and easy to work with. I recommend staying at her home to any and all considering, you won't want to miss out on this experience! And her neighbor Steve and his wife across the street were quite friendly as well. Thank you to the moon and back, Heather! Heather was super easy to work with. The neighborhood was perfect. Easy walk to ocean beach. The short walk to both the bay and the ocean makes this property our ideal vacation spot. We were so happy to spend our third summer vacation in this house. The proximity to NYC, the beach, the bay and great restaurants, makes this a true jem. Sunset views are just a short walk to the end of Harbor Road. The house is clean, nicely decorated and fully equipped for cooking. We enjoyed entertaining and taking in the beautiful scenery on the rooftop. Given that the house is surrounded by the bay, there is typically a nice cross breeze if the windows are open. For nights that are particularly warm, there are window air conditioners in the bedrooms that take out the heat and humidity. The house is fully stocked for the beach with chairs, towels and kyacks. The beach wagon made it easy to bring all our beach gear to the ocean. My husband and I are hoping to return for a week in 2019. My family and I had an incredible two weeks in Heather's home. She had all of the supplies for the house and beach that we could need! The home was clean, comfortable, and perfect for a family with tons of games, toys and books for the kids. We can't wait to return!! We celebrated our daughters 40th birthday over the 4th of July and it was a perfect house for the 6 of us! My brother and sister in law live directly across the street and it was an all family reunion! 6 kids and 10 adults! Perfect for getting to the beach and the bay. The top deck made for perfect viewing of the july 4th fireworks. Hope to revisit in 2 years for the next members 40th! All and all it couldn't have been better! Charming cottage with a terrific location that has easy and close access to the ocean and the bay. This was the second year that we rented. The cottage was spotless, nicely decorated and had all the amenities required to cook and make a beach vacation comfortable. Proximity to the beach, bay, town of Westhampton and dining was key. Watching the sunset nightly was a treat. We plan to come back next year! check in 4 p.m. check out 12 p.m.